Last month at the Food Truck Festival the hubby and I were chatting with Michelle of Fun and Fearless in Beantown. She asked us about our weekend and about how far we drove in to enjoy the barbecue brisket at the market. My immediate reply was, "On Sundays we usually drive for food". I laughed at how it sounded, but it's really true. Many of our weekend adventures involve heading to a farmers market, a festival, or an interesting restaurant. We don't eat out during the week (well, maybe we sneak a lunch or two out) and weekends are when we let someone else do some of the cooking. This weekend I was on my own for my adventure. I knew my starting destination and headed out with no particular agenda or return time. I love to wander, one thing leads to another, and it becomes an adventure! I fueled up for my adventure with a slice of homemade whole wheat bread topped with homemade fig spread (recipe at the end). With an iced coffee from Red Barn Coffee Roasters in hand I hit the road and in about 30 minutes I arrived at the Harvard, MA Farmers Market. I'd heard great things about the market and they have an informative and interesting website. There were a lot of new-to-me vendors and I spent some time chatting with all of them and picking up some great things. I also spent a lot of time taking photos during the day. I'll highlight some of my favorites throughout the post. I hope you check out the slide show included in the post for all of my photos. A bright yellow booth caught my attention and I stopped by to see what they were selling. I met the lovely Joanna and tasted her delicious biscotti. We started chatting and it turns out that Joanna just started her baking business and this was her second weekend at the market. After careers in marketing and kitchen design, she decided to take her well-tested biscotti recipe to the commercial kitchen and bring it to the public. She has more than 10 flavors. I picked out the orange walnut (with a full pound of walnuts in the 6 oz. of biscotti!). I look forward to trying out more flavors! Hopefully she'll bring her treats to one of the winter markets in the area. She doesn't have a website yet, but she is in the process of setting it up. I also picked up a delicious whole wheat plum cherry scone from The Biscuit (from Somerville, MA). 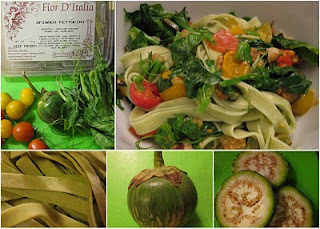 I munched on that while I gathered some other goodies like pea tendrils, a whole chicken (no giblets), parsley, spinach fettuccine, and parsnips. Another new-to-me product was lupine beans. I had never heard of them before - turns out they blend into a flavorful and healthy hummus. After sampling a few flavors, I took home a cilantro flavored hummus. You can read about the lupine beans here. I packed up my purchases and decided to wander through Harvard toward my absolute favorite fall stop - Bolton Spring Farm. Every fall since I first came to Boston for college, I've made a trip to Bolton Spring Farm. Three things I always buy there: hot apple dumplings, hot apple cider, and a Yankee Candle (apple, pumpkin, or cinnamon scented). They have apple picking too, but it's up a hill, so I usually pick up a pre-picked bag. This trip I got a half peck of Paula Reds, a cider donut, and a 'Be Thankful' candle. Since I was on Route 117 with no agenda, I headed east toward Verrill Farm. At this point I really didn't need any more veggies or fruits, or so I thought...On my way to Verrill Farm I made a quick detour to Applefield Farm. They were at the farmers market and I decided to stop and see their real farm. I added three hot peppers and a cute green eggplant to my loot and got back on the road. At Verrill Farm I added fresh figs, a beeswax candle, and an orange to my collection. I know the orange doesn't scream "Hey, it's fall", but my favorite apple cake calls for orange juice. Sometimes you just have to go with it. When I got home, I laid out my purchases to see how crazy I went. Not too bad! I really love the magnet that I got at the market. It was a fabulous day! 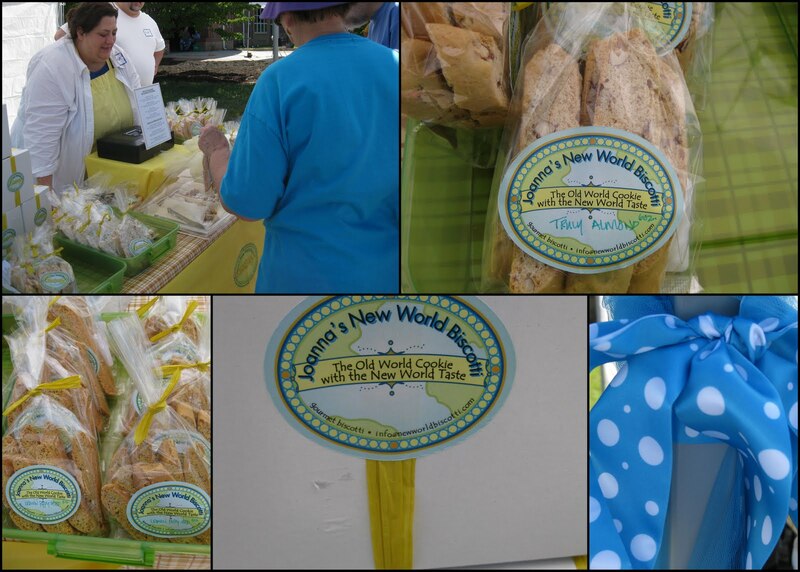 Beautiful weather, friendly farmers and vendors, and of course delicious food. I cooked up a quick dinner from my finds, and ended up making it three more times over the weekend (it was that fresh and good!). I had a great time taking photos - instead of a post with all of them, I hope you have a minute to watch the slide show below to see what food fun awaits you here in the suburbs. Recipes from the posts follow the pictures. Where do your food adventures take you? What do you like to do when you have no agenda? It sounds like you had an amazing day! I am incredibly jealous that you found good bagels and that you got an apple cider doughnut. It's almost time for me to make those again this year. Love them. I just checked out Bolton Spring Farm's website and might try to plan an apple-picking trip there. Thanks for the info! Sounds so fun! I love apple cider donuts... dunked into apple cider. I'm a fall-o-phile. I love every place you mentioned! Sounds like a perfect Sunday to me- I am rather jealous! 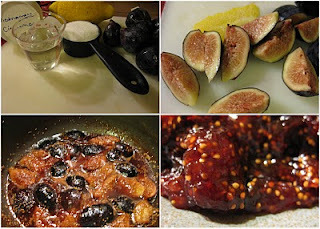 The fig jam sounds delicious as well! Love this post! Great idea with the slideshow, sometimes I find that there are so many pictures that I want to share but don't want my post to be forever long. That jam looks killer. I'll trade you some rice krispie treats for some? Katie - it's a deal! I'll bring the jam! Will drive for food - love it! LOL, love the idea of driving for food...I think many of our outings sort of end up that way as well. That late summer bounty looks lovely...fig jam and hot apple cider all in one day...I'm jealous! That sounds like an amazing way to spend a day! I am looking forward to visiting some farms for apples and other fall treats. And those bagels. . . I can literally taste them and am glad I am going to NJ this weekend to my favorite bagel stores! I had a blast at your market! I look forward to heading back this year too!